An ADB-supported water kiosk has helped ger area villagers save time collecting clean water each week. Photo credit: ADB. Ger areas in Mongolia are informal, unserved, or underserved urban settlements characterized by long strips of large plots of land and lack of basic services. In 2006, the Asian Development Bank funded a project that aimed to improve the living conditions and quality of life of the people in these areas. This led to the upgrade of basic urban services, urban roads, and on-plot facilities in the target communities. About 60% of people in Mongolia now live in urban areas. An estimated 330,900 or 46% of total households are in ger or unplanned urban settlements that lack basic services. Poor sanitation—with almost exclusively open pit latrines, irregular waste collection, and limited access to water—which is supplied at often distant kiosks—have created highly unsanitary living conditions. Likewise, poor access roads to schools, markets, and health facilities limit mobility and increase time burdens, particularly for women, in ger areas of two large cities, Ulaanbaatar and Erdenet. Women are primarily responsible for retrieving water for households – this is a daily time-consuming activity. Ger area residents, especially women, had to wait, sometimes long hours, for water trucks to arrive. There was often a shortage of water. Likewise, residents of Bagh Rashaant would have to walk for 10 minutes just to collect water. They may make several trips a day to get the amount that they need. Parents who take their children to school in downtown Ulaanbaatar would have to walk with their kids all the way to the junction on the dusty dirt road or get an expensive micro-bus to the main junction, and then another bus to the school twice or thrice a day. The old access road to Orbit Takhilt, which has a population of 27,144 or 7,540 households, was a dusty dirt road with no dedicated paths for walking. Several women interviewed said they had to walk down the unsafe and unlit road or take expensive micro-buses from the junction as they have no other option. the creation of employment opportunities for women, which will continue beyond the life of the project. “Assessment of and planning for gender issues up front helped to ensure the achievement of the multitude of positive gender impacts which are possible, even from small infrastructure Investments,” says Tuul Badarch, Senior Project Officer at ADB’s Mongolian Resident Mission. The project installed 58 new water kiosks and refurbished 33 water kiosks, which provided direct gender benefits in the form of immediate, adequate, potable, safe and more accessible water to 41,611 households in five project areas with 135,370 residents, 51% of whom are female. With the new and refurbished project kiosks, a continuous supply of water is now available, and the time burden for accessing water has been reduced. 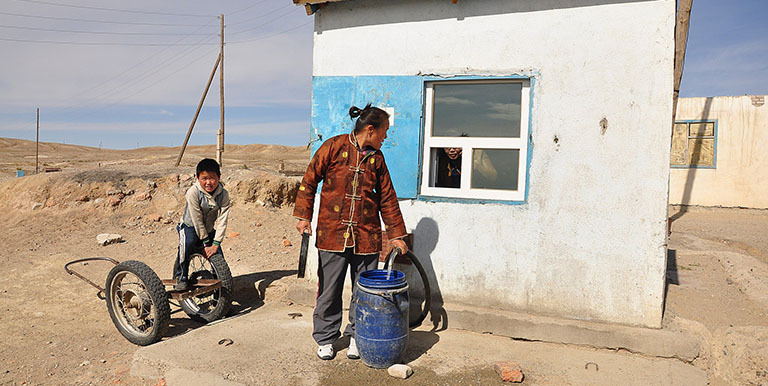 In Erdenet, 65% of ger residents now have access to safe drinking water within 200 meters of their homes, compared to the baseline of 45% in 2010. They no longer have to make several trips a day to far water sources. “The safer water kiosks with its fewer transfer points also reduced risks of contamination,” said Munkhnairamdal, who manages one of the kiosks. She said water is directly supplied to the kiosks through pumps and pipes. The Gender Action Plan promoted equal work opportunities for women. Nearly half or 39 of the 86 people who were employed at water kiosks, water reservoirs, pumping stations, and sewage treatment plants were women. They are now permanent employees of the Public Utility Service Organization. Ensuring that employment opportunities were flexible, community-based and close to women’s ger area homes contributed to increased female employment. This feature is an important lesson learned for future projects – ensuring that employment options are adapted to the needs and time constraints of women. Thanks to a new ger area access road between the outskirts of Ulaanbaatar and the new school, ger area residents especially the parents save a few precious hours every day because the trip to the school with their children now takes only ten minutes on foot. ADB’s investment in the road became a catalyst for the building of the government-funded school in 2012. Two female teachers, Enkhtsetseg and Ariunaa, said the number of students has grown rapidly from 600 to 1,050 (60% of them girls) between 2013 and 2014. “Previously, the children had to go to school in the downtown area. Now, there is a school right in the middle of their ger area,” they said. In Orbit Takhilt, Baruun Salaa, and Khailaast ger areas in Ulaanbaatar, three access roads, totaling 12.3 kilometers, have been built by the project with dedicated bus stations, street lighting, and safe pedestrian paths on both sides of the roads. Now, the more affordable public transport buses provided by the municipality go all the way down to the end of the road where the last ger area residences are located. Female residents reported that they feel more secure as a result of the well-lit, dedicated walking paths. The other feature of the project’s Gender Action Plan is the microfinance component which will enable 1,000 women from 1,000 ger area households to improve their on-plot facilities, including direct water connections. Female-headed and low-income households are encouraged to apply for small loans. To help promote women’s voice and legal representation, the Gender Action Plan includes a gender target: at least 30% of the loan and legal documents will require women as signatories or co-signatories. Asian Development Bank. Mongolia Urban Development Sector Project. ADB. Urban Sanitation and Rural Infrastructure Support to PNPM Mandiri Project. ADB. The Key to Unlocking Development Gains: Empowering Women and Girls. Prior to her role as thematic chief, Wendy worked in the urban and social sectors division of the East Asia Regional Department on PRC and Mongolia and, among her responsibilities, led ADB’s first loans and technical assistance projects in PRC on technical and vocational education. She has an M.Phil. from Oxford University and a PhD from John Hopkins University. Tuul has worked in various sectors of ADB’s operation in Mongolia, including transport, energy and social protection. Currently, she is responsible for the urban development sector and manages several ADB-financed projects aimed to improve utility services and management in provincial towns. Prior to joining ADB in 2005, she was a project manager for a World Bank-funded urban project and a researcher in the Democratic Party of Mongolia.